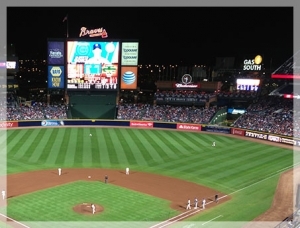 Cheer on the Braves at the brand new SunTrust Park! Speedy Wiz is here to make sure your group gets to and from the game with ease and comfort. With our private group transportation, fan groups of any size can travel to any Braves home game—preseason, regular season, postseason, or playoff—without any of the usual stress. SunTrust Park promises to be everything you’ve dreamed of in a new stadium, but getting used to the new location, traffic patterns, and parking options can take a while—so leave it to us! Put on your favorite jersey, grab your lucky hat and let Speedy Wiz take care of the rest. We can pick you and your friends up from any location across metro Atlanta, drive you to the game, and even pick you up after it’s over. You won’t have to give a second thought to directions or finding and paying for parking. Concerned about how you’ll tailgate if you’re not driving your own car? Just join the party that’s guaranteed to already be in full swing—any items that will fit in the vehicle (that you can either throw away or take into the stadium with you) can come along as well. Gloves to catch those Braves homeruns and foam fingers are a must! Your vehicle options depend on the size of the group you’re planning on traveling to the game with. We offer everything from SUVs, to vans, to full-sized buses. Let us know the number of people in your group and we’ll help find your perfect vehicle. Speedy Wiz Transport is here for all your Braves transportation needs. Trust our exceptional service and highly trained and courteous drivers to get you and your group where you need to be safely and on time. Check out the full Braves schedule to see which games you want to attend, and give Speedy Wiz a call to help you get there! Reserve your transportation now, or reach out to us online or by phone at 770-928-4550.